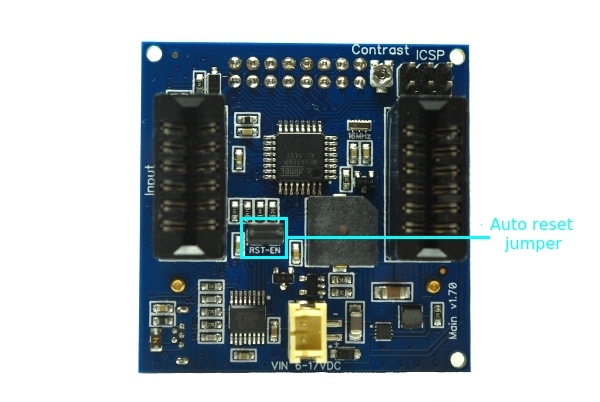 The firmware residing on the osPID consists of several components tied together. Arduino bootloader: We are using Arduino Duemilanove’s bootloader on the osPID main board. Every osPID unit is shipped with the latest firmware. To see what version of the firmware is currently installed on the unit, power up the unit (either by the USB connector or the external DC jack) and the firmware version will be shown on the LCD. Current version of the firmware is v1.70. 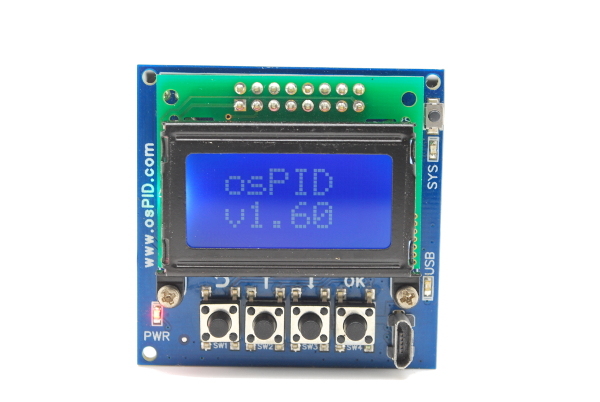 One of the benefits of the osPID is the ability to update and change the on-board firmware. As with the Arduino, the default osPID behavior is to restart whenever a new serial connection is made. This makes it very easy to upload a new program to the unit. Unfortunately, this can be a problem during normal operation; If the osPID is running and you want to connect with the Front-End, you DO NOT want the osPID to reset. For this reason, we have included a jumper on the back of the main board. If the jumper is present, the unit will auto-restart. If absent, the unit will only reset when the reset button is pressed.